Oconee County’s three legislators in the Georgia General Assembly last week voted in favor of House Bill 316 that selects new voting machines and responds to allegations that voters last year were denied access, absentee ballots were not counted and vote tallies were incomplete. The vote on the House bill was partisan, and Sen. Bill Cowsert from the 46th District, Rep. Houston Gaines from House District 117, and Rep. Marcus Wiedower from House District 119, all Republicans, sided with the Republican majority. All of Oconee County falls into the 46th Senate District, and 10 of Oconee County’s 13 precincts are in the 119th, with the remaining three in the 117th House District. Clarke County is the dominant part of both the 117th and 119th, by registration, and makes up a significant part of the 46th Senate District. Rep. Spencer Frye, a Democrat representing House District 118, which falls entirely in Clarke County, voted against the bill. Sen. Frank Ginn, a Republican whose Senate District 47 includes parts of Clarke County, voted in favor of the bill, which now is on the desk of Gov. Brian Kemp awaiting his expected approval. The partisan nature of the choice of voting machines surfaced in the February meeting of the Oconee County Democratic Party, where Oconee County Elections and Registration Director Fran Davis spoke on the operation of her office. The Oconee County Democratic Party will meet at 6:30 p.m. tomorrow (Thursday) at the Oconee County Chamber of Commerce, 55 Nancy Drive in Watkinsville. Norman Garrett from Monroe, Democratic Party chair for the 10th Congressional District, will be the guest speaker. 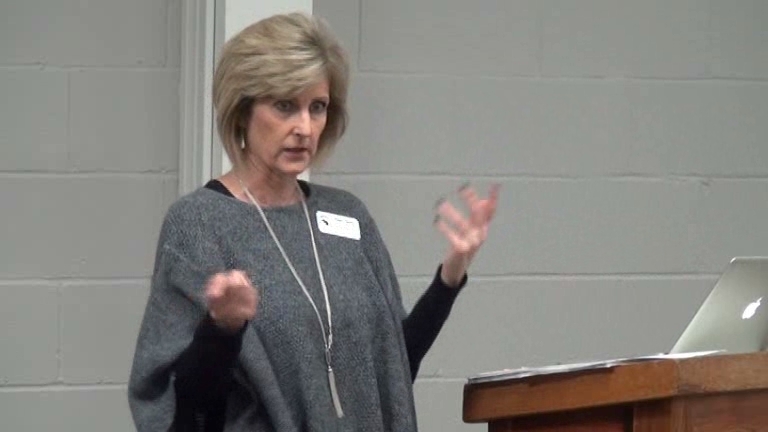 Davis told the 20 persons who attended the Feb. 21 meeting of the Oconee County Democratic Party meeting about the operation of her office, offering an overview very similar to the one she gave to the Oconee County Republican Party at its meeting in November of last year. “I don’t think anyone has ever experienced elections like we just had this last year,” she said. Controversies surrounded questions of access, the counting of absentee ballots, cleaning of voter lists, and final vote counts. Kemp retained his seat as Secretary of State, which oversees elections, until after he narrowly defeated Stacey Abrams in the gubernatorial race. Davis mentioned selection of voting machines at the beginning of her comments. “It is my hope we can all feel comfortable with whatever choices the legislature makes for us,” she said. Her role will be to implement that decision, she said. Her office is overseen by a five-person Board of Elections and Registration. She chairs that Board, on which sit one representative of the Democratic Party and one Republican Party representative, and two persons appointed by the Oconee County Board of Commissioners. Davis did say, in her opinion, going to paper ballots filled out by voters and then scanned would require more training of voters and staff than using a touch screen to create a paper ballot for subsequent scanning. And the printing of paper ballots would add extra expense, Davis said. House Bill 316 selected the touch screen devices that produce a paper ballot rather than the paper ballot filled out directly by voters and then scanned. At the local Democratic Party meeting, as well as statewide, issues were raised about the security of the touchscreen machines as well as about the willingness of voters to proof the ballot printed by the machine carefully before it is submitted for scanning. Davis said she lacked detailed knowledge about the issue of security. Davis explained that a commission appointed by Kemp selected the touch screen and paper ballot option. That decision has been controversial in part because the commission recommended that the state buy the type of voting machines sold by Election Systems and Software of Omaha. Kemp then proposed spending $150 million on the voting system, an amount that matches estimates for the cost of the system promoted by Election Systems and Software. And former state Rep. Chuck Harper of Carrollton, who was an Election Systems and Software lobbyist, now serves as Kemp’s deputy chief of staff. House Bill 316 also changes the time before a voter becomes inactive from three to five years. Voter registrations would not be canceled for inactivity until two years after notification, effectively extending the time for cancellation by two years. House Bill 316 also would change Georgia’s exact match law. At present, applications for registration are put on hold if there are discrepancies between government records. They became active voters by showing proper identification. Under the new law, applications would be come eligible voters, but they would have to establish their eligibility at the time of voting. Under House Bill 316, Georgia would join with other states to track voters who move. House Bill 316 states that local election officials could not make changes to precincts, including relocations and closures, in the 60 days before a general or primary election. Instead, such voters would be sent an absentee ballot with “Provisional Ballot” marked on the outside. House Bill 316 also would change the percentage from 1 to 0.5 for a losing candidate to be able to request an automatic recount. Barry Flemming, a Republican from Harlem in Columbia County, introduced House Bill 316 on Feb. 14. The House passed a substitute bill on Feb. 26, with 101 in favor and 72 against. Gaines and Wiedower voted in favor of the bill, and Frye voted against it. On March 13, the Senate passed a substitute bill, with Cowsert and Ginn voting in favor. The bill passed the Senate 35 to 21. On March 14, the House agreed to the Senate version of the bill, in a vote of 101 to 69. Gaines and Wiedower voted with the majority, and Frye voted against the bill. The video below is of the Feb. 21, 2019, meeting of the Oconee County Democratic Party. Eric Gisler, co-chair, presided at the beginning of the meeting. Melissa Hopkinson, also co-chair, presided at the end of the meeting. Davis began her comments at 13:30 in the video. The Oconee County Republican Party did not meet in February.